Another Veganuary came and went. As the calendar page was turned, a collective sigh of annoyed relief went up around the world from farmers who use social media. For anyone unfamiliar with Veganuary, it is an online veganism campaign coinciding with the New Year. It probably started as a way to peacefully promote and spread helpful information about an alternative diet and lifestyle, but it quickly became an ugly circus where the farmers that feed our country are bullied, insulted and threatened. I know first-hand the toll this additional stress can take on the mind of a beleaguered farmer already dealing with the depths of winter. It's unpleasant to say the least. I have been threatened with both personal harm and financial ruin. My children have been insulted and threatened. My words have been twisted and distorted. For a movement supposedly rooted in compassion and love, the online vegan animal rights activists campaigning for Veganuary certainly don't exude those traits towards farmers. These zealots have seized the month of January — with all its resolutions and "new you" nonsense — and are trying to capitalize on the opportunity. The method is simple: brazenly and haphazardly attack farmers on Twitter, Facebook, and Instagram. To be clear, some vegan activists attack farmers on social media all year round. That's not new or noteworthy. They're just exponentially more brave, aggressive and tiresome during the first month of the year. Clearly this characterization doesn't extend to all vegans. I'm sure there are polite, peaceful, quiet vegans out there. They just don't make themselves known. The militant vegan movement's online tactics frustrate me for a couple reasons. First is the arrogance. How arrogant do you have to be to feel entitled to dictate diet and life choices for the rest of society? You can go be vegan, that's fine. I encourage everyone to make those choices for themselves, but no one should fight to remove someone else's choice to eat what they want or live how they want. The other major fault is the use of misinformation and manipulation to further the agenda. By all means, hold us in animal agriculture accountable. We want and need that as an industry. But using misleading photographs and bad information to try to destroy an entire industry of family farms is downright sad and criminal. I don't make this claim lightly. My daily work proves the ignorance of these militant vegans. They claim I kill all my bull calves as soon as they're born because they're useless to me. I have never killed a bull calf in my entire life. In reality, no one does, but it sounds terrible and shocking so it gets spouted off like fact. Are we perfect as an industry? No, but we're trying to be better all the time. We're improving in all aspects of animal care and comfort. We have strict rules and guidelines that must be adhered to at all times. There has never been a better time to be a farm animal and it's only getting better. This constant improvement has nothing to do with militant vegans and everything to do with farmers caring about their animals and their industry. My most important point is that, as a farmer who loves his cows, I want to weed out bad seeds from my industry more than any vegan possibly could. I hope that every farmer loves their cows as much as I do. I know that the vast majority do. If there are any out there that don't, I want them found and stopped for the sake of the cows and the industry that I love. I believe animal agriculture will still be here long after this whole movement of militant online veganism has passed by the wayside. I imagine there will always be vegans, but this annual uprising we've experienced the last few years is just a blip of a fad. I think I speak for online farmers everywhere when I say we'll still be working to feed the nation next January. Cam is a dairy farmer from Osler, Sask., along with his partner, Jaime, and their children. 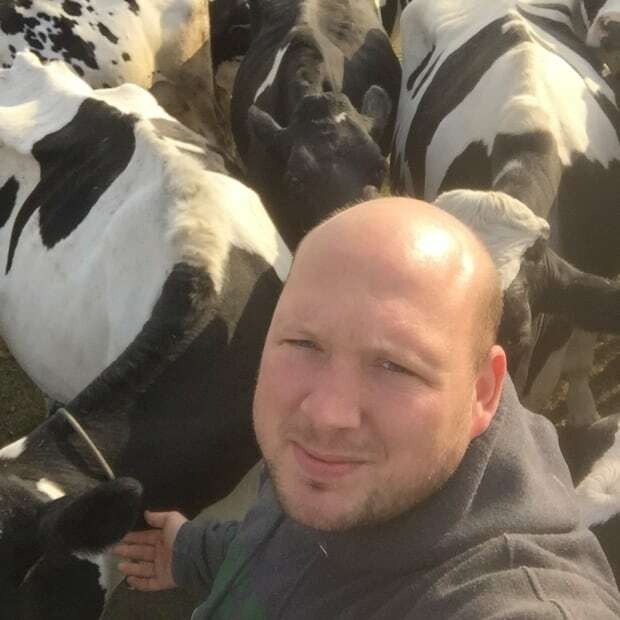 They milk 42 Holstein dairy cows.